Not every modern woman knows how to iron a mens shirt properly. In fact, it is not difficult! In order to learn how to iron men's shirts quickly and without any folds, you need to remember a few simple rules. First, it is better to iron a shirt in a particular sequence: start with the collar, the yoke, and then proceed to the cuffs, sleeves, and only at the end of the Ironing bar, shelves and back. Collar iron from the corners to the middle with the wrong side, turn it over on the front side and do the same thing. It is not necessary to bend the collar through the small stands and ironed the crease, it turns out very ugly. Then ironed the yoke. To iron the long sleeves begin with the cuffs. Like collar, cuffs, first ironed on the reverse side, and then from the front. If you use the stand for Ironing sleeves, you can just pull on her sleeve and iron in a circle. Repeat the same with the second sleeve. If you stroke the classical way, fold the sleeves at the seam and outwrite from seam to the edge with the top down. Make sure that edge didn't stick bends. The main part of the shirt can be ironed in different ways. First method: ironed separately right shelf, which with a button on the back left shelf and right at the end of the bar. Second method: lay the shirt on the narrow part of the Ironing Board, smooth it round. Secondly, linen and cotton shirts should be ironed while they are still slightly damp. If the shirt is dry, it is recommended to either sprinkle it with water from a spray bottle, or wrap it for a few minutes in a damp towel. As for the silk shirts, they should be well dried and ironed through a damp thin fabric, but not the gauze, as after it can be prints. On shirt, faux-silk not to splash water spots may remain. 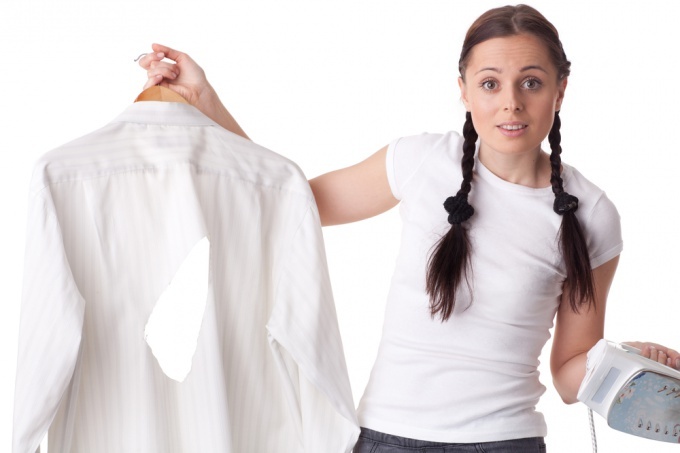 Third, in order not to burn the shirt, choose the mode of Ironing depending on the type of tissue. For example, a cotton shirt is ironed at a temperature of 150 degrees using wet steam. And fourth, men's shirts made to stroke from the front side. On the reverse side need to iron a shirt only dark colors, so it left white streaks from the iron, and a shirt of shiny fabrics, so they are not faded. Below you ironed men's shirts pleasing to the eye with its purity and perfection, and the process was fast, efficient and not tiring, it is recommended to follow a few rules. The process of Ironing a shirt, whatever its color, texture and size begins with the sleeves and collar. The collar is ironed on both sides, and at first this is done from the inside, and then from the front side. The iron must move from the corners to the center. When the collar is ironed, take it to the ends and pull slightly to the side, which allows to remove all the creases. Then move on to sleeves. First iron both sides of the cuffs, first the wrong side, and then the front, carefully avoiding the buttons. Below the buttons are not melted or was pushed into the fabric, it is desirable to cover the gauze. After cuffs you can move on to Ironing the rest of the sleeve, moving from shoulder to cuffs along the fabric fibers. Otherwise, over time, the thing out of shape and stretch. To avoid the shooter on the sleeves of their stroke better on special planks or a little pillow stuffed inside the sleeve. Such a pad can be done independently of the folded in the form of a rectangle large towels – it is also suitable for Ironing shoulders. After the collar and sleeves, you can go to the shelves. Start with the right flooring, carefully avoiding the area of the buttons. Special attention should be paid to pockets and valves. Similarly, the iron left a shelf, carefully paving the area of the hinges. Completes the process of Ironing back. Cotton, flannelette, linen and flannel shirts need to be ironed at a high temperature with lots of steam. Especially, it relates to a dry or badly pressed shirts. Silk or shirts with the addition of the synthetic iron in the second mode, using almost no vapor. Synthetic stuff is good because Ironing is almost no need – they are easily straightened if to hang them on a chair or coat rack. If necessary, iron them on the lowest temperature, no steam. There are situations when you want to pet the thing completely unconventional way, when you have a hand of iron. For this stavroula shirt smooth on the table or any flat surface and lightly sprinkle with water. Then slightly pull it in different directions, smoothing the fabric, allow to dry. If the shirt jammed in one place, then do the same procedure locally. Heavily creased shirt can go in the bathroom and include there the hot water, closing tight the door. Under the influence of its own weight it lies flat. If the thing is creased from lying in a suitcase, you could just put it on the man and hold on to it with wet hands.